2. What idiom does the cartoonist illustrate in this cartoon? What does this idiom mean? 1. The Trump administration ended NAFTA (the North American Free Trade Agreement) between the U.S. Mexico and Canada). The U.S. negotiated a new trade deal that will be fair and reciprocal with Mexico in August and gave Canada a deadline of September 30th to join in or be left out. Canada finally agreed to a deal on September 30th at the last possible minute. 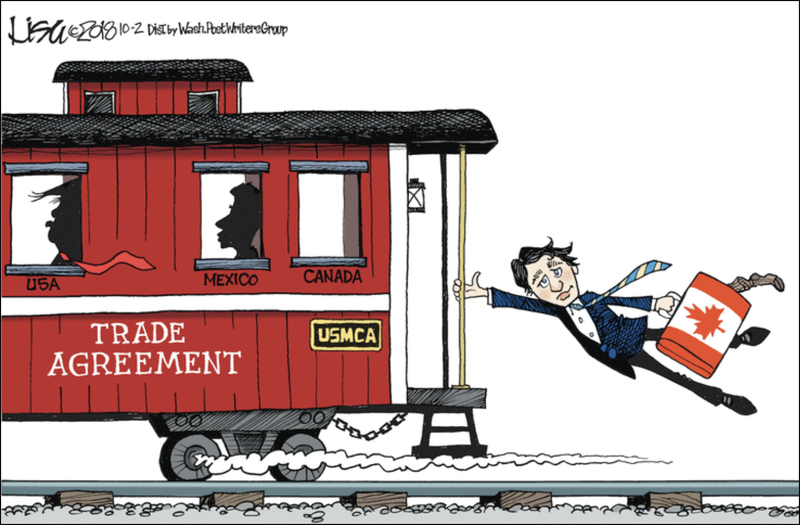 The new trade deal is named the United States-Mexico-Canada Agreement (USMCA). Canadian Prime Minister Justin Trudeau got on board with the new trade deal at the last possible minute.